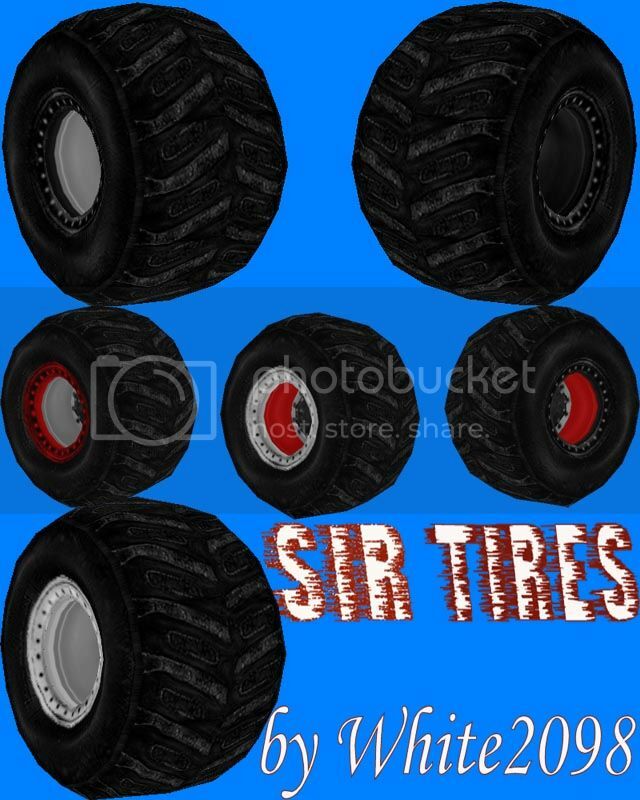 These are my second attempt at the SIR tires. They are more rounded than before and have new textures. All credit goes to me, just list my name in your trucks readme file. Then save the tires as a new and unique name so they don't overwrite my tires! but please make sure you rename the tire if ANY changes are made! Awesome looking tires White, I haven't tried them on in game yet, but they look superb from the Binedit truck editor. I am sure these will be as (if not more) popular as the last set you released, they look stunning. I think we should call you the "tire master", White2098. Why thank you for putting them on two of my trucks, good sir. White, these are, by far, the greatest tires I have EVER seen come from you. Scratch my comments about the last two sets. THESE are the ones I am going to use from NOW on (Unless, you know, you make an even SICKER set). Dang, that's a lot of pictures! Thanks for the compliments guys/gal! Agree there, these most likely look good on just about anything. They look good, but they make the truck to narrow, so I'll stick with what I got. Just edit the size of the tire. Click "Model" then "Resize." All you have to do is open the truck .trk file and widen the wheel base. I did this so trucks would turn sharper. Actually, this was a small mistake on White's part that I found while scoping them out. He didn't center them on the X axis, so therefore, with a basic axle, you don't see the axle connecting with the tire at anytime past about 4.3 on the X axis of the wheelbase. If you center them on the X axis, it puts them in the right position for the truck, and then it doesn't make the truck look weird. That wasn't a mistake. It's a quick way to make trucks turn and drive sharper. All you have to do is move the wheels inward in the .TRK file until you like where they are. That takes literally 15 seconds tops. White, I've spent more time than just about anyone working on perfecting the handling of trucks. I have to do so to be competitive online. I know you can move the wheels in on the X axis, but for my truck handling, I like my X axis to sit at exactly 4.49. To me, it was a mistake, which obviously it wasn't. I fixed it by centering the tires on the X axis, rather than moving the X axis around on my trucks. Either way, it fixes the issue. And actually, for those of us that use sponge trucks, moving the tires past about 4.3 on the X axis, especially down to something like 4.2, causes excess body roll and actually makes the suspension stiffer and will even cause the back tire to pop up off the ground when trying to turn, essentially spinning you out. Just one of the many things I've found in my 3 years of modifying handling. I understand what you were going for, just letting you know it may be an inconvenience to some people who race online and have their setup tuned exactly how they want it. I was just letting them know how to fix it rather than moving the X axis around. Sorry for calling it a mistake. Thanks for the clarification Runt. I did that for just a general purpose because a lot of the trucks I tested them on turned very poorly. I figured the easiest way would be to set them off the axis by half a foot and if somebody with a custom setup wanted to change that they could do it. I didn't think it would be that hard to figure out. runt, they are referred as cheat trucks over here.